How many times have you come home after work or from picking the kids up from soccer practice to an empty refrigerator or, better yet, a fridge full of food, but nothing prepped and the kids - and you - are STARVING!! 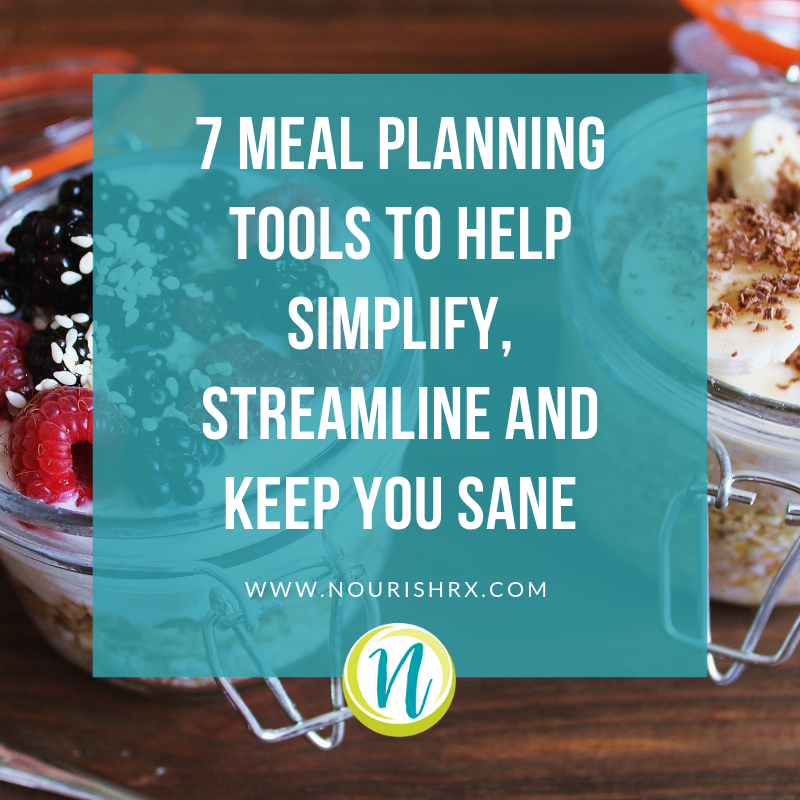 Enter your email address to receive a FREE download of: "7 Meal Planning Tools to Simplify, Streamline and Help Keep You Sane." Check your email, your download is headed your way! Our go-to for meal plan inspiration! “Pin” your favorite recipes and organize your “boards” by meals, snacks, desserts, etc for easy access when inspiration is needed. We love exploring the creative tips and visually appealing recipes that make planning meals practical for your busy lifestyle. In addition to delicious meal and snack ideas, check out the kitchen gadgets that can save you time in the kitchen. Check out our Pinterest boards for some of our favorites! Feeling in a rut with your packed lunches? Bento boxes are a fun way to ensure a balanced meal with variety. Bento boxes include food containers of varying sizes, which not only encourages great variety, but can also help keep your food from getting soggy. I love using bento boxes with kids, challenging them to pick different foods to fill each container. Bentology and PlanetBox are two of our favorites. Need some inspiration? Head over to our Pinterest page where we've "pinned" a few of our personal favorite bento box meals. Crockpots and instant pots are a convenient way to make delicious meals with little hands-on cooking time. Three simple steps for success: add your ingredients to the pot, set the temperature and timer, then serve when it's done! Imagine tossing ingredients into the pot before work and coming home to a hot, ready to enjoy meal...yes please! Start by choosing from an endless assortment of recipes, and plan for leftovers. Are you thinking, "But I don't have time to prep a meal before work though?" Don't worry, we thought you might ask that...that's why the next meal planning tool made the list. These countertop meal makers are also reasonably priced, so what are you waiting for? Another item likely lurking in your kitchen are these gallon size plastic storage bags. We like to use these bags to store prepped meals awaiting the crock pot / instant pot. Referred to as "dump dinners" you simply "dump" all ingredients for a meal into the bag to be stored in the freezer for a later date. Just don't forget to label the outside of the bag with the name of the dish in addition to any instructions for the meal so that you're ready to go when it's time to prepare. Here are a few "dump dinner" recipes for you to check out. I'll admit it, there have been full weeks where my entire family has consumed every breakfast and lunch from one of these glass jars. Breakfast jars of oats, banana and peanut butter or Greek yogurt with granola and assorted fresh fruit. Stacked salads for lunch that won't get soggy thanks to the wet ingredients added first. When ready to eat, shake it up and pour it out! Try fun jar accessories for added convenience: use the Cuppow mouth piece to sip liquids without splash back, or use a divider cup to separate veggies and dip. The Cozi app is like a personal assistant for your busy family. This app features organizational tools like calendars, shopping and to-do lists, and even meal planning! The meal planning tool helps manage fun recipe ideas while making grocery lists to ensure you don’t forget any ingredients. Was the dish a hit with the kids? This app has space for recipe notes and a tag for favorite dishes. This one might just be my favorite kitchen tool of them all! Make meatballs that hold their shape, pre-cook some mini egg frittatas for a quick breakfast or whip up some portable energy bars. You can also portion and freeze various sauces that can quickly be re-heated for an impromptu pasta night. Perfect if you are making a dinner for one and don’t want to open up an entire jar. What are some of your favorite tools that help keep you organized? Share with us! Disclosure: This post contains affiliate links, which means we may receive a small commission if you click a link and purchase something that we have recommended.